Crystal Audio Video Design has a wealth of experience in installing a wide variety of home entertainment speaker systems. Pricing varies according to the customer's desired look, what type of wall brackets they want, and if they want all the wiring concealed, either in the wall or on the wall, run through tubing. Please feel free to contact us to learn about all your options. 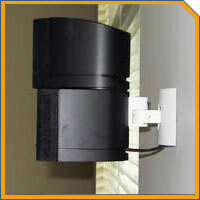 And for some speaker install examples, visit the Speakers Install Gallery. Running wire from speaker to component, exposed along exterior side of the wall. Wire is visible. Running single cable wire inside the wall from speaker to baseboard. Cable wire is NOT visible from speaker to the board. Then, from board to the component wire is exposed along the floor. Optional white tube concealment (1/4 inch) along the board to component if location permits. 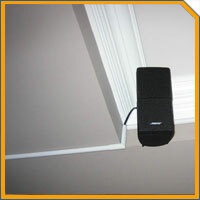 In addition to vertical concealment, running speaker wire BEHIND the baseboard to component, if location permits. Cable wire is NOT visible at all. This complicated process involves removing the baseboard, drilling holes and studs, running the wire behind the baseboard and placing the baseboard back. During the process, the wall and baseboard are exposed to higher risk of damage, possibly will require baseboard replacement and wall patch up with minor paint touch up. Running plastic white (could be painted) tube from the speaker to the baseboard, and/or, along the baseboard to component.